Learning about animals is fun when your favorite Disney characters lead the way! Stunning live-action wildlife clips of animals in their natural habitats are combined with heart-warming footage from Disney's animated classics to introduce youngsters to the world of animals. 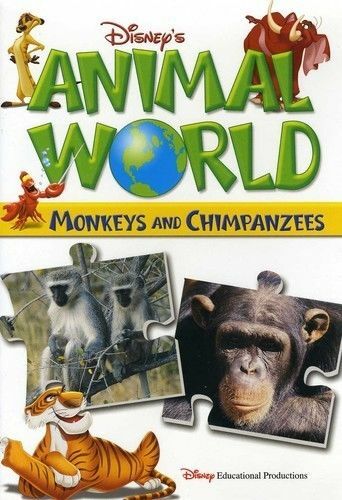 Each segment stars a different animal, offering kids detailed information about the animal's habitat, living conditions, behavior, diet, survival techniques, and life cycle. Monkeys: Children will have more fun that a barrel of monkeys watching clips from Disney's The Jungle Book that bring these resourceful, charming animals to life. Swinging from tree to tree, captivating creatures can jump nearly 30 feet between branches! Chimpanzees: Explore the human-like behavior of chimps, see what a "knuckle walk" is, and find out how their uniqu intelligence helps them survive in the wild. Humorous footage from Disney classics- Tarzan and Aladdin- introduces you to our hairy relative, the gregarious chimpanzee.